The award winning SeceuroBar security window bar system uses tough powder-coated steel bars which are locked in place on the inside of windows, in either a vertical or horizontal format. Strong extruded aluminium retaining units secure each bar, yet the unique locking system means that they can be released in seconds. Please Note: If this product is being installed externally we recommend that you select the zinc base primer option. Powdercoating of the bars and grilles: The coating is fused by heat to produce a continuous film and curing of the coating which gives its design properties. The result is a high performance finish that delivers exceptional corrosion protection, durability and resistance to yellowing making it suitable for both interior and exterior use. The process is virtually emission free, so is environmentally friendly. Gloss: A highly reflective smooth surface. Gloss surfaces due to their highly reflective appearance tend to highlight surface imperfections. Satin: A satin finish is not as reflective as the gloss finish and because of this is less likely to show any surface imperfections. Satin finishes also provide a good surface for cleaning and resisting abrasion. SeceuroBar security window bars are operated by a single radial lock point. The key must always be pressed in before any key rotation is possible. All occupants of the building must be familiar with the operation of the system, and aware of the key’s location. 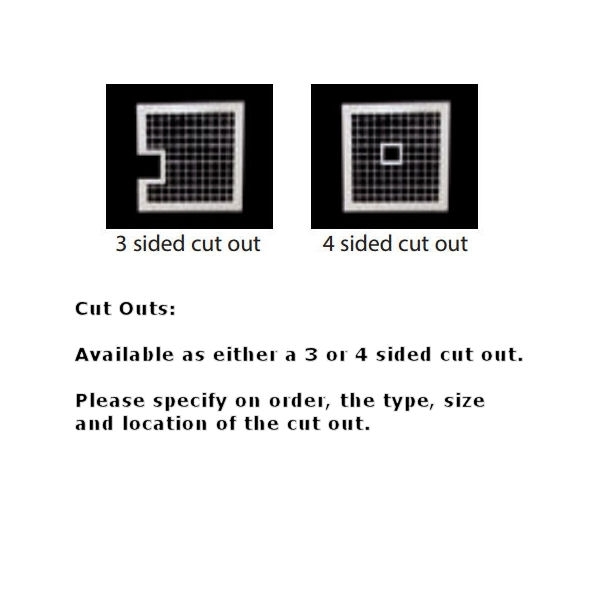 *Please let us know the number of cut outs required, the size and location of the cut out. 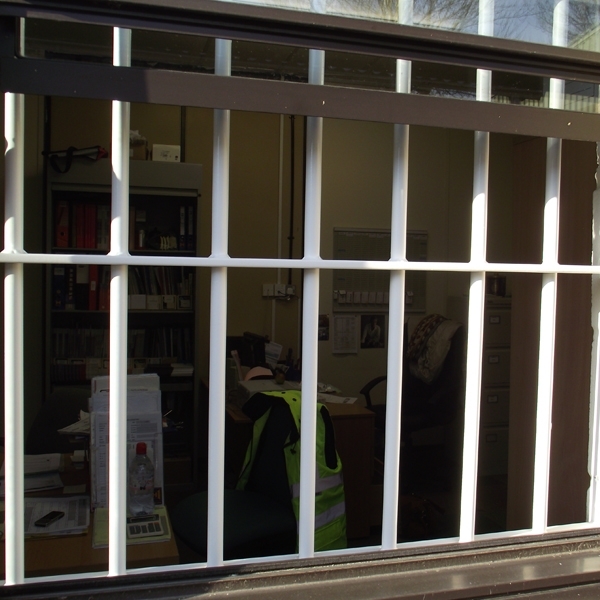 View our page on Security Window Bars. 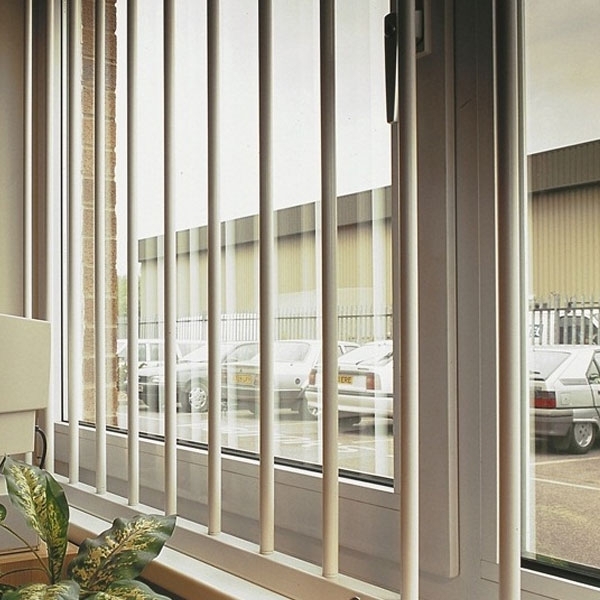 The security bars for windows system is designed to fit as close as possible to the window frame, this will avoid any cavity for dust and dirt to collect in. The top and bottom retaining units can be placed up to the window frame and the fixing positions marked with a pencil, the retaining units can then be removed and the appropriate size hole drilled. The minimum recommended fixing is 10 x 2” (50mm) countersunk wood screws (see fig. 1). It is very important that countersunk screws are used, these will allow greater clearance in the top retaining unit. It is usually necessary to create a small recess directly below the lock position to allow the bottom fitment to seat correctly. For wider or horizontal bar applications the fixing plates can be secured within the retaining unit by using masking tape or a small amount of silicone sealer. (This will eliminate fixing plate movement). Before finally tightening the top and bottom retaining units the end caps should be moved out to the end of the opening, this will provide a neat and even finish to the system. The location of the fixing screw can beseen to the right. The operation of the window bar system along with the finish of the retaining units and window bars are guaranteed for a period of 2 years against faulty materials and workmanship. The warranty period commences from the date an item is invoiced. Where a warranty claim is upheld, SWS UK will supply all necessary parts to enable distributors / installers to complete a satisfactory repair. The warranty terms do not extend to cover labour and consequential loss arising from any claim.